$20.99 & FREE Shipping on orders over $59 $35. 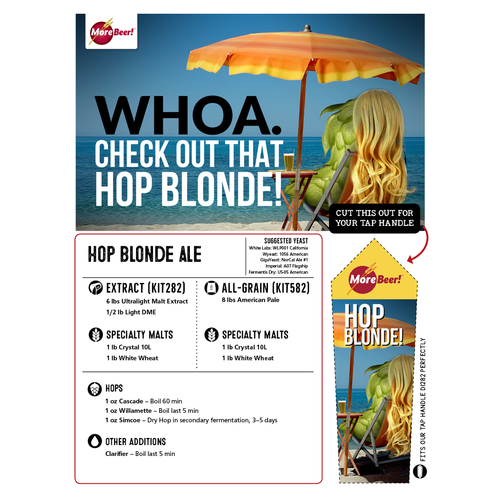 This Hop Blonde is definitely one that you won't forget! You'll dream about it. You'll get nervous when it is near, but you know that you two are made for each other. 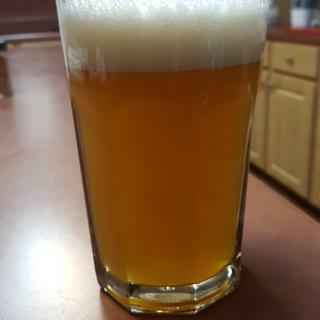 The recipe is a fairly standard blonde recipe, but it's that "Simcoe personality" that makes this blonde so unique! 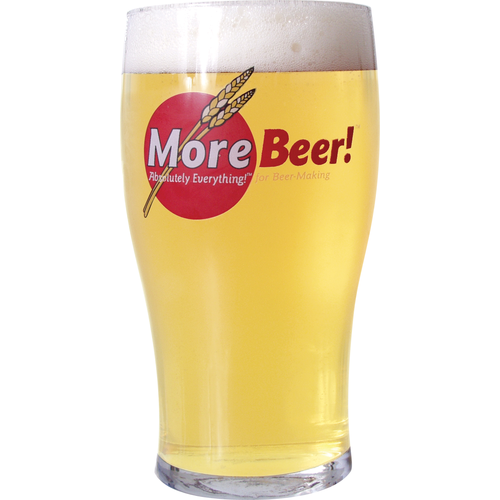 Our Hop Blonde is well balanced, and the dry hop addition makes this beer slightly complex, but still easy to enjoy. Needed a lighter beer for company. I'm all about Porter's and stouts. Love this beer, its apart of my normal rotation. Great summer beer. Looks like a solid beer. Still new to this and looking at the color this seems like a good beer to attempt, I wasnt into how dark and cloudy some of my past home brews have been. what are all the ingredients for this beer? BEST ANSWER: Hop Blonde Ale: Grains= 8 lbs American pale, 1 lb White Wheat, 1 lb Crystal 10L Hops= 1 oz cascade, 1oz Willamette, 1 oz Simcoe. I recommend doing a yeast starter with White Labs WLP001 California Ale yeast. I was a bit at odds with the hop scedule. Cascade full boil and Willamette at five minutes and dry hop with high alpha simcoe...Seemed backwards, I boiled with simcoe and dry hopped with cascade. Nice and fresh with citrus, and pleasant tang from the simcoe. Young, hazy, and hoppy. Wheat and dry hop gives it haze; clear ir and loose all those flavors. Tweaked the recipe a bit. .5oz at 60 min, .5oz at 30, 1oz at 10, 2oz whirlpool. Used Omega Hornindal Kviek pitched at 90 and fermented at 90 for 6 days. added 2oz Amarillo day 7, 2oz. Simcoe day 8 and 1lb of blood orange candi syrup. Let that ride for 2day and cold crashed for 4 days. Added blood red orange to it at the end of the boil. It went so fast that I had to order it again. One of my go to brews. At $20, I thought this was a great option to experiment with a Pineapple Bonde Ale recipe I was messing around with--and it turned out pretty good! I would suggest this recipe to most people. This one was amazing. We kicked the keg fast after this one. I really enjoyed this beer. I split the batch. 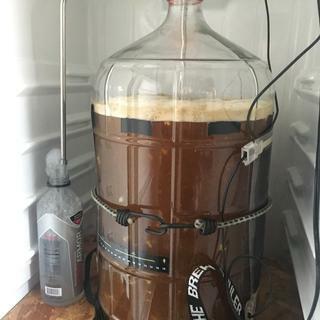 I did 2.5 gallons per the recipe and 2.5 gallons on an extra 1oz of Mosaic hops for 5 days. Both came out amazing and tapped at the same time. I will buy this kit in the future and experiment dry hopping with something new each time. The hard part is keeping it around long enough to see if it gets better with age. Bought two of these so far and about to brew my third. Great beer left by itself. I double hops up on 2nd batch and it got a nice mild ipa flavor going on. I like blondes more sweet so going to do it again, with less bittering hops and see what happens! Ordered 3 of these kits. All of them have turned out great. I got 70% to 75% efficiency on average. Added and extra ounce of Chinook @ 30 minutes and an ounce of Simcoe at flameout for a much hoppier taste and aroma on the 2nd and 3rd batches. Makes a great "poorman's IPA". This beer has good head retention and lacing to the bottom of the glass. GREAT value for the money. For the price, it doesn't get any better. This beer is incredibly smooth and easy to drink, while also showing a very nice bitterness and aroma, thanks to the Simcoe finish. Also, not sure if I had super awesome efficiency (didn't take a gravity reading on this one) but after 2-3 of these beers I seem to start getting super buzzed. Not that I am complaining at all. I purchased this kit back in December. At first my wife was unsure about the hops combo. 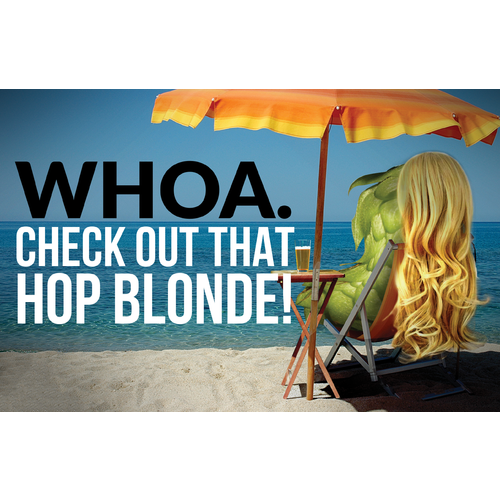 (its different than regular blond ale.) but she liked this beer even more. Great taste and light on the pallet. After 5 weeks the bitterness mellowed out and became too easy to drink. Smooth going down easy to pack away 6-8 beers a night. If you want to try out dry hopping then THIS is the kit for you. Also + on the kit its only 18.99... Amazing deal! This is a great recipe, medium to light body without overwhelming hops. Good malt flavor, dark gold color with a hint of red. GREAT head retention. My efficiency with biab is somewhat low so I added 2 lbs of 2-row pale malt for 1.050 sg. Ended up about 5.5 abv. 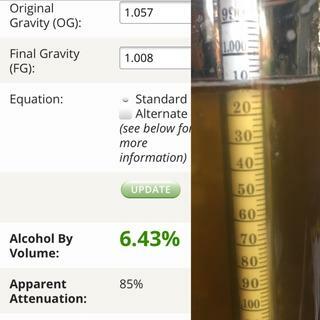 I went a little light on the bittering hops with about .8 instead of 1 oz. I didn't do the dry hopping but may try it on the next batch. Very refreshing and way too easy to drink.